Detail: It doesn't seem to be very easy to see what's happening on clients without going to the client. I would expect there to be a way to see *all* ESET driven actions and logs from inside ERA and those should be actionable -- example: See that a website was blocked by Web Protect in ERA, right click on that and whitelist from a context menu. example: See that an application was blocked incoming or outgoing by the firewall from inside ERA, right click and whitelist or make a new rule from a context menu. Right now this is all very hard and time consuming to manage. Detail: We're deploying ESET and it's overwhelming because of so many options. That's a good thing, but because ERA doesn't record much of what is happening on the client side I can't really tell what's going on without spending large amounts of time researching each option and testing with a client in a sandbox. @nhesetnod32 Thank you for reporting. We will be tracking improvement request for that in the future. 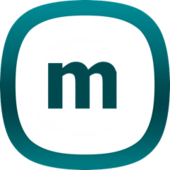 However as we do not get that much requests for the MDM-related functionality, it does not get very high priority. @ludolf I will be tracking improvement requests for both of the reported issues. @Sunwardsquash Thank you for the feedback. Concerning the "one click" resolutions, for reported problems, we are working hard to improve those in the future. In the upcoming V7, there will be option to one-click resolve various application problems, and also add exclusions directly from the threats. We want to continue in this direction, so basically address other cases that you have described (web protect, firewall, etc ...). We are also planning to improve the set of data that is being collected. Concerning the templates - can you be more specific? Do you mean policy templates, with more precisely described recommended settings for specific use-cases? What specific policy settings you have found confusing / problematic? Detail: It would be nice if we could configure the agent to report somehow (in an way that's easy to see/report) if a user excludes a folder, turns off parts of the file scanning, etc... Currently, it only reports if the whole thing is turned off, but there are other (non reported) ways to achieve the same things. You can request the configuration one by one currently, and check it manually, but that's not easy, and very time consuming. It's really only a problem because there isn't much data inside ERA. For example--we're having an issue now (ticket submitted) where ESET is blocking Infopath forms. We have no idea what's causing it, and no triggers or alerts are being generated, but because I turned something on it's being blocked. Some things that would be helpful are "best practice" standard policies that explain what the different settings do and what they're for. In absence of that, my goal would be that any action ESET takes be logged to ERA somehow so I could track what's going on centrally and adjust accordingly. It's nice to see you guys taking the time to read these! Thanks. Detail: Ability to automate the copy process of installation files (not only *.msi) to the endpoint and then execution of installation command + parameters. Proper exit code recording and handling. we do have the option to choose "remove other antivirus products". Well guess what? I published it through policy and forticlient got removed on all computers and laptops. Can you please give us an option that we can see a list of what kind of programs will get removed. So we are able to uncheck the ones and then create the package? Does that make sence? Right click a pc and update the eset program on the pc and server. Without making a task. Is that an option! A list of removed programs can be found at https://support.eset.com/kb3527/#removable. @Florian87 Can you please elaborate more? What is the use-case you want to achieve? Would you like to use ESET ecosystem to also roll-out other, 3rd party applications, or are you just talking about the the way ESET installers are handled? 1. When ERA says "Operating system is not up to date", provide more information. We have several workstations that say OS not up to date, we update, restart, update, restart, still "OS not up to date"
2. 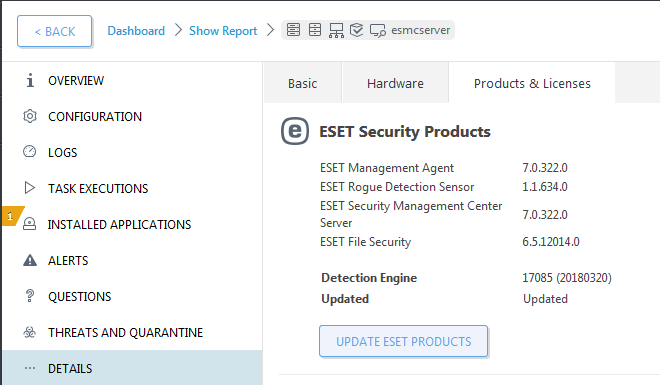 The computer list shows ESET products in the "Security Product" column, it would be nice if it showed other third party products when no ESET product is on the machine. 3. I would like to customize the action menus. For example "Send Wake-up Call" & "Connect" are useless to us since 95% of our workstations are off-site. 3a. It would be terrific if the action menus included a Favorite Tasks option that would function like "Last Used tasks" but allow us to define a few (10) of our favorite tasks. 4. Ability to export policy to XML file, then import that XML file. ERA is an amazingly powerful tool, frequently, I know there has to be a setting in there somewhere, but I cannot find it or perhaps, I want to add 20 items, it would be a heck of lot easier if I could export to XML, view/edit XML, then merge it back in. 5. Any integration you could provide with ScreenConnect would be nice. For example I'd like to have the "Connect" action menu remote me into the client's workstation using ScreenConnect. 1, What operating system is it? If Window 10, then not all updates are part of Windows updates. If you don't want to be notified about missing OS updates or only about critical updates, you can disable / configure this feature both in an Endpoint and ERA agent policy. Marcos: Thanks. It's a mix of W7 & W10 causing the update issue. The notification is valuable, we want it to continue, but need a bit more information to help us resolve the alert. 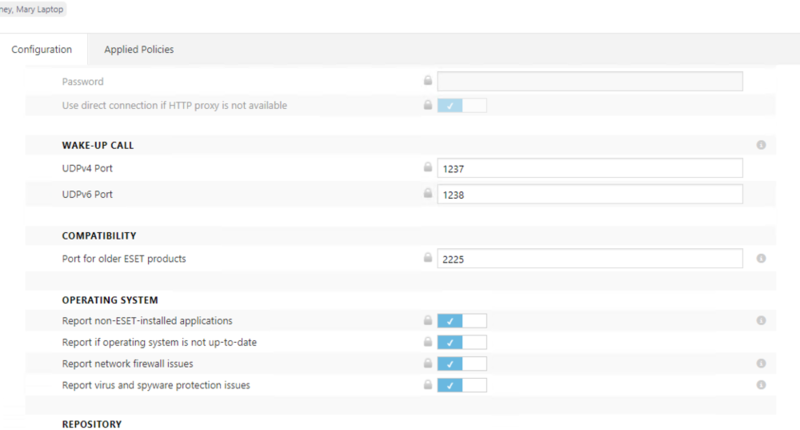 I changed the non-ESET application setting - looking forward to getting this information, it affects less than 10% of our clients, but the information will be helpful. @katycomputersystems Thank you for your feedback. This was already responded by Marcos. AFAIK, we are doing some changes in the V7, that will shorten the interval between how often agent queries OS for the OS update status. Therefore, it should not report "outdated" when the system was updated already. Btw, do you update using ERA, or you update using another method? Eventually, if this does not disappear after the upgrade to V7, we will suggest opening a customer care ticket, with agent trace logs from the period when you have attempted the update, for our analysis. Also, what version of ERA Agent do you use? Also, is the feature for reporting OS not up to date enabled in Endpoint Security? How is this set? Security Product column refers only to a "ESET" product. We can´t determine, whether the application installed is a security product or not. Also, as this is rapidly changing, it might be difficult to update it regularly. The best would be to either create a dynamic group, focusing on specific vendors, or create a report of "all installed apps" and then manually searching for a specific app / vendor. We will track improvement request for that, but this might be a bit more difficult to make. We are already tracking improvement request for this. Can you elaborate more please? Do you mean export policy from ERA in XML format, so you can edit it, and then import back? Or? As of now, policies are exported in a proprietary format, used only by ERA, and this format is not XML. We will note this. ScreenConnect is owned by ConnectWise. Do you use any other ConnectWise applications? I will share this request with my colleague, who handles various integration plugins, to analyze, whether something like that will be possible. Description: Able to determine the "reason" why the task failed in the Task Execution History. There's no way to find out "why it failed" until I go directly to that system and do a manual check. Having some sort of reason why it failed helps the sysadmin to figure out how to get it updated, if it is at all possible. Typical example yesterday, in which I was attempting to install ESET EAV on a machine. The report said "try installing the product locally." Did this and then realised that I was trying to install EAV when I should have been installing ESET File Security for Microsoft Windows Server. In this case, I would like to see the report come back and say something along the lines of "Detected O/S: Windows Server 2016. Compatible products are ESET File Security for Microsoft Windows Server." Like wise, if it were a linux system, then "Detected O/S: Ubuntu Server 16.04.4. Compatible products are ESET File Security for Linux / FreeBSD." etc. The agent has all the info about the O/S, so why not use that information and parse back some meaningful information? Personally, I think this would allow us to sell a lot more ESET. Going a bit further, I wonder if it is possible to get the expiration date of the installed product? Then a month or two before the competing product is due for renewal, we as MSP's can go in and quote for the renewal. Personally, I think this would allow us to sell a lot more ESET. Going a bit further, I wonder if it is possible to get the expiration date of the installed product? The problem with this is that there's no unified location for storing information about license expiration dates of installed software. @LCS I agree, I like the idea by myself too. We will discuss this internally, whether there is a viable solution to find it. It will simplify the migration to ESET, which is our common interest. @MichalJ Thanks for your comments, yes we are a MSP, though our world view is similar to an IT department of a large organization. For example, a hospital would organize their departments in a manner similar to how we view independent customers. 1. We are using eset, WuInstall and abc-update to keep Windows up to date, of course W10 attempts to keep itself updated on its own. Our preference is to update as soon as Microsoft releases updates. The problem I have is that I cannot seem to clear the "Update Needed" flag in eset, I assume that means that there is a missing update that requires manual intervention, I would appreciate eset Remote Administrator's assistance in helping us identify the issue. I suspect the issue is logged somewhere - that is after all how you are determining that the system is not up to date. 2. If Security column only refers to a ESET product, what is the point of this setting? 3. You are breaking my heart, I still love ESET Remote Administrator, but would be much happier if I had the ability to easily set commonly used tasks. Currently, it is a multi-step process. 6. I only use ScreenConnect. Can you integrate the ESET AV Remover tool into ERA? It can detect AV-s, remove them, and you have a list in your KB site with all the AVs that it can handle. Thank you, for the additional feedback. We will investigate the Windows Update issue. It´s basically affecting the data, that is reported to reports "installed applications" which is in the "computer details / installed software" and in the respective reports. Basically after that, it will start reporting all apps, installed / registered on the OS (Windows, Mac, Mobile). You can then work on preparing a "dynamic group", that will list all computers with a specific vendor name in there (there will be a great improvement coming in the V7, where when you will choose conditions (like application vendor), it will show you all of the values in the DB, which will make it simpler to achieve this to a limited extend). Also, the V7 will allow you to filter computers, without ESET Security installed, directly in the "computers" pane. As I have said, we will track the improvement, but we will have to discuss internally, about how to do it. We would like to give you the option to use "tags" and then filter out tasks with a selected tag (like "favorite"). Understood. I will also track improvement for explicit warning, that when you change the policy product, your entries will be lost (I agree, that it might be annoying). @SysEPr It is already integrated in the ERA agent. You can run a task "software uninstall" where you can choose the option to use the AV Remover, to clean "supported applications".